The Norlake NLCB84 AdvantEDGE™ chef base holds heavy equipment on its worktop while keeping refrigerated product cold in four drawers. It can hold as much as 1,560 pounds, and its marine edge keeps messes on the top. As many as 10 full-size pans can fit in the drawers (adapter bars are included, but pans are sold separately). 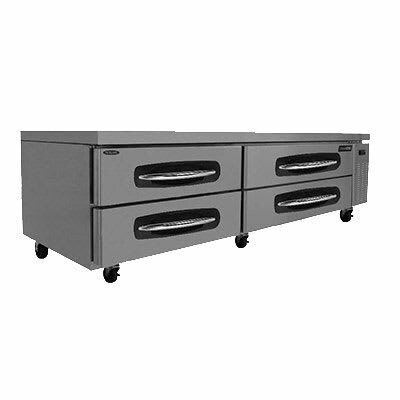 Durable and quick cleaning, the drawers, interior, and exterior are made of stainless steel. Six 4-inch casters enable operators to move the Norlake NLCB84 chef base, which maintains temperatures from 34 to 38 degrees Fahrenheit. 4 drawers can each support as much as 200 lbs. Unsure if a chef base is right for you? Read more about them in the chef bases buyers' guide.